If you’re looking for an easy and effective way to spruce up the décor of your home without breaking the bank, custom window blinds are a worthwhile option to consider. These custom window treatments go the extra mile to add a splash of sophistication to any interior design scheme. In addition to providing a quick facelift to rooms throughout the home, custom blinds can be enhanced with a variety of convenient and useful features. Upgrade them to more effectively insulate your home, to provide enhanced privacy, or to block out light – but most importantly, custom blinds let you achieve the perfect look and fit with blinds designed for your windows. An accurate fit: Even if the windows in your home are standard sizes, ready-made blinds don’t always fit properly due to small variations in construction. If your house has custom windows, custom blinds are an absolute must. Improved privacy and light control: Custom blinds are designed to fit your specific windows, so the fit is far more accurate. As a result, you won’t have those annoying gaps at the sides, top or bottom that reduce your ability to control light and to enjoy privacy. Improved energy efficiency: Today’s custom blinds can be enhanced with special insulation that allows them to keep heat inside during the winter and out during the summer. Their accurate fit also enhances their overall energy efficiency. More design choices: With custom blinds, you get to specify the precise materials, finishes, hardware, colors, and other features, which allows you to achieve a seamless, cohesive interior design scheme. An excellent investment: Custom blinds improve the comfort and style of a home, and you can start enjoying the return on your investment right away. They’re also a great selling point when listing a home for sale, and they can help to make your home more marketable. Thermal insulation: Custom blinds can be upgraded for enhanced energy efficiency. Insulating blinds can help to retain or resist heat that would otherwise be lost through windows. Thermal insulating pockets are often sewn into the back of the decorative fabric; other times, a foam-like material is used to enhance insulation. 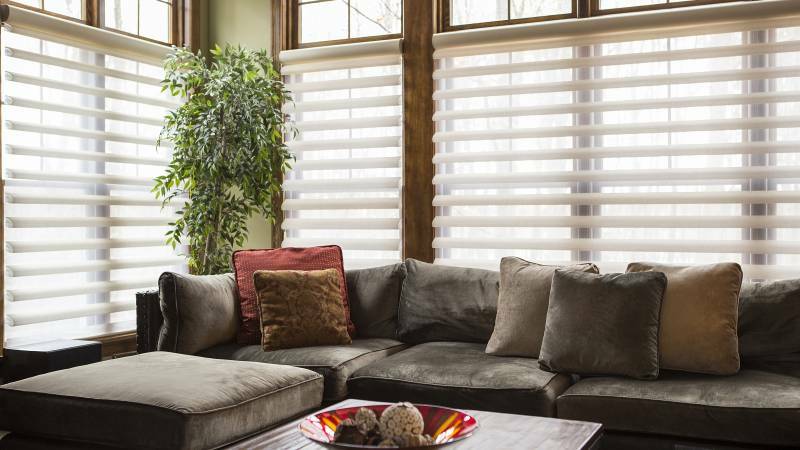 Blackout fabric: Blinds make it easy to control how light enters a room because the slats can be adjusted as needed. With the addition of blackout fabric, which is typically sewn onto the back of the slats, custom blinds can help you to get a better night’s sleep—even during daylight hours. Cordless operation: If you have pets or children, you can order custom blinds with cordless operation. Just adjust them with the touch of a hand and avoid worrying about tangled cords that can pose safety hazards. Top-down, bottom-up operation: Rather than moving only from the top down or the bottom up, custom blinds can be designed to do both. This option is especially useful for rooms with lots of windows because it allows you to achieve the perfect balance of shade and light. Given the many benefits of opting for custom blinds, most people find that they are more than worth the investment. In fact, they are more affordable than you probably think. According to HomeAdvisor.com¹, you can expect custom blinds to set you back by around $150 to $200 per window; depending on the options that you want, you might tack on an additional $1,000 or so. Professional installation, which is highly recommended, typically runs around $80 to $250. If you’re looking to install custom blinds without breaking the bank, you can do so – you just need to do your research before picking blinds and a professional installation team. Search online to compare different custom blind options, and see which features will offer you lower prices. You can also search for quotes from local installation pros to find deals or discounts on installations throughout your whole home, or on a certain number of windows. Knowing what you now do about custom blinds, you should be in a good position to start zeroing in on what you need. Like anything else, selection, prices and quality vary from one supplier and contractor to the next, so it definitely pays to devote a little time to researching the available options. The best way to find local professionals who can craft the perfect set of custom blinds and install them problem-free? An online search. Searching before choosing means you can hunt for the best price and the right blinds that suit your home’s interior design. With a little time and effort, you’re sure to find gorgeous custom blinds for your home that are affordable to boot! If you’re interested in custom blinds for your home, start a search today.